Nintendo just announced that Ike from Fire Emblem is returning to Smash Bros. So, he's not a new character to the series, but he now looks...different. And in Japan, some are mocking his pumped up appearance. On popular game sites like Hachima and My Game News Flash, there are commenters calling the muscular Ike a "gorilla." 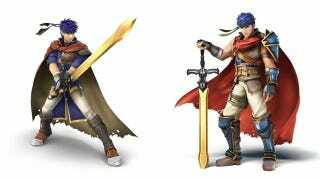 Below you can see a comparison between Ike as he appeared in 2007's Super Smash Bros. Brawl and how he will appear in the upcoming Super Smash Bros. for Nintendo 3DS and Wii U. "And here's gorilla Ike!" wrote one commenter. "Why'd they have to make him look like a gorilla?" asked another. "Who is this gorilla?" asked yet another. Meanwhile, on 2ch, Japan's largest forum, some commenters said the beefy Ike looked like Ryu from Street Fighter. Oh, and people thought the new Smash Bros. character looked like a gorilla. As noted by Kotaku tipster Kitsunenoyomeiri, many Japanese tend to like thinner characters with muscles—instead of simply, muscle men. Make no mistake, these thinner characters are strong, but they don't simply rely on brute to win. Rather, they use technique as well. In the West, sheer strength tends to be favored, especially in video games. That doesn't mean everyone online in Japan hates the gorilla Ike. "This gorilla Ike works for me," said one commenter on My Game News Flash. "My chest is going to get warm." On Hachima, one commenter wrote, "He's macho. I'm in love. I am a dude, though." A 2ch commenter wrote, "I think gorilla is cooler." What do you think? Do you like old Ike or the new macho version?